Every cat guardian recognizes “the sound.” You know, the one your poor kitty makes as she is about to deliver from the depths of her stomach a precious little bundle of…vomit. Yes, it’s not the most glamorous topic. But vomiting in cats is not only stressful for us (why do cats miraculously seem to always find the one piece of carpeting or fabric in a 1,000 square-foot radius to regurgitate on? ), it’s stressful for our cats too. It can cause dehydration, loss of electrolytes, and let’s face it… on the list of favorite things to do, vomiting does not usually rank highly on anyone’s list. As humans, we’re often able to pinpoint the exact cause of an unwelcome revisitation of our stomach contents (that $5.99 discount seafood buffet sounded like a good idea at the time). However, the things that make our feline friends regurgitate differ quite a bit from ours. So put on your waders! Here are the 4 most common causes of vomiting in cats. Hairballs are an unfortunate by-product of our kitties’ cleanliness. When your cat grooms herself (or other cats in the household), the velcro-like barbs on her tongue pull out hair, which she swallows. Since hair is indigestible, it usually passes through the GI tract and is eliminated in the litter box. However, sometimes hair forms a matted clump in the stomach that isn’t able to pass through. Its only source of elimination is to be ejected through vomiting. The resulting hairball is not a “ball” at all, but rather a cylindrical tube of tightly-packed hair (molded into this form as it comes back up through the esophagus), sometimes surrounded by a puddle of fluid. Hair can also cause an inflammation of the stomach lining known as “hair gastritis”, which can cause a cat to vomit fluid or food without actually bringing up visible hair. Your cat may have several of these episodes before she is able to successfully expel a hairball. You can reduce episodes of hairballs by regularly brushing or combing loose hair off your cat and by feeding her a high-fiber diet. If she seems to be suffering several episodes closely together, you may want to consider a commercial hairball remedy. The most popular hairball remedies on the market are flavored gels that, once swallowed, stick to ingested hair and help it slide through the GI tract more easily. There are now also chewable products available that taste great and may be easier to administer to some cats than gels. Another common reason cats vomit is from eating too quickly. Since cats are 4-legged and thus have a horizontal (rather than vertical) esophagus, swallowed food can hit up against the esophageal sphincter (a ring of smooth muscle fibers that closes off the stomach from the esophagus), and cause regurgitation of food just a few minutes after eating. Ninja Cat plots his next move. Cats in multiple-pet households where there is perceived competition for food often have a tendency to gobble too quickly. My cat Trouble (nicknamed “Ninja” for his uncanny stealth abilities) is particularly adept at eating his own food in record time and then attempting to “help” the other two cats by eating theirs as well. This causes our senior kitty Jasper to inhale his food, which then sometimes comes right back up. We’ve solved this problem for Jasper by allotting enough time to monitor all the cats while they eat, and by splitting Jasper’s meal into 2 smaller portions fed about 15 minutes apart. There are several dietary factors that can cause vomiting. Your cat might be eating a poor-quality diet, or one that is too rich (some cats, like some people, have more sensitive stomachs than others). Abruptly changing a cat’s diet without slowly transitioning from an old food to a new one can also cause stomach upset. Milk is a also a common culprit. Just because some cats enjoy the taste of cow’s milk does not mean they are able to digest it properly. In fact, cats are actually lactose-intolerant, since they lack the lactase enzyme necessary to break down lactose in milk. This can cause vomiting and diarrhea, so it’s a good idea to hold the moo-juice! Food allergies can also cause intermittent vomiting. If your cat looks and feels fine and is not losing weight, but still vomits for no apparent reason, be sure to discuss it with your veterinarian. Lastly, make sure that your cat does not have access to human junk food. I recently read an article about an owner whose cat was morbidly obese and had a “penchant for lunch meat and Doritos.” How would a cat know that he has a penchant for Doritos?? Regularly feeding human junk food with artificial dyes, chemicals, and preservatives is just asking for a one-way ticket to chronic GI inflammation for your feline friend. Cats are, by nature, extremely curious creatures. They like to chew and swallow lots of things they shouldn’t, including pieces of plastic, string, fabric, toilet paper, sticks, and cat toys. Although in most cases these small items eventually find their way through the GI tract, any one of them can cause a cat to vomit. If an object is unable to be vomited up or moved safely through the GI tract, it may become lodged in the stomach or intestine. (You can learn more about intestinal obstructions in my “He ate what?” post). If your cat is vomiting continuously, appears to be in pain, and is not eating or drinking, call your veterinarian immediately. It’s important to remember that an occasional bout of vomiting in your cat is probably not serious. If she’s still eating, drinking, and having normal bowel movements, the vomiting was probably an isolated incident. However, frequent vomiting in cats can indicate other more serious conditions, so be sure to let your veterinarian know if the vomiting happens more than just intermittently. Remember, dealing with a little occasional vomit is a small price to pay in exchange for the pleasure of sharing our lives with our wonderful feline friends. So the next time you’re cleaning up that stubborn spot, just keep in mind that your kitty was probably only following one of the 10 original “Cat Commandments”: If you have to throw up, get to a chair quickly. How can i strengthen his Immune system,,any Idea ? Our immune systems can be affected by many things, from viruses to stress. If your kitty is otherwise healthy and doesn’t have a compromised immune system due to having Feline Leukemia Virus (FeLV) or Feline Immunodeficiency Virus (FIV), you can help bolster it by making sure that he’s on a high-quality diet and trying to keep his environment as low-stress as possible. 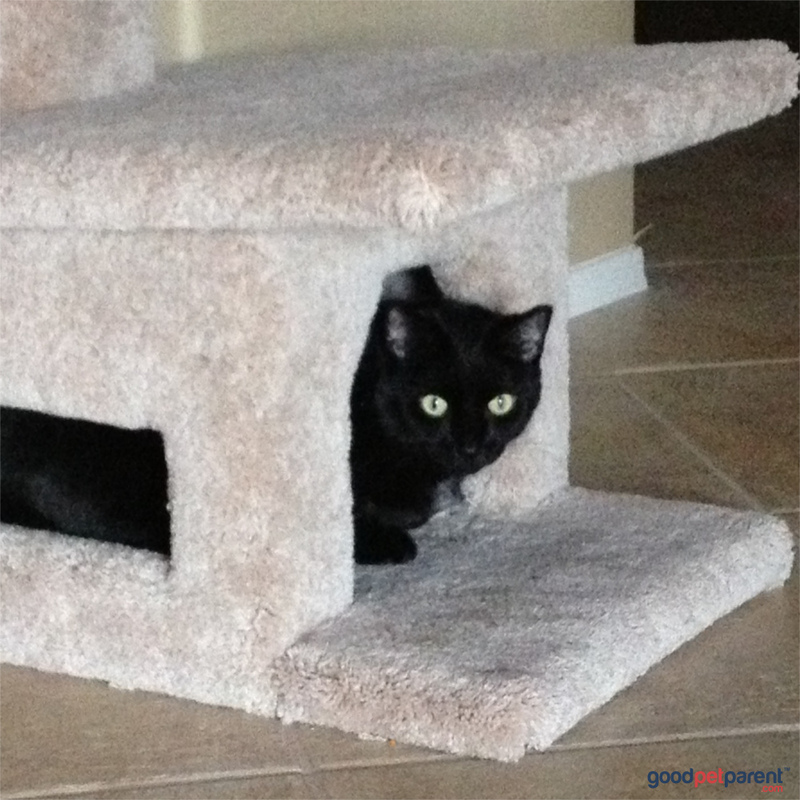 If you have multiple cats, it would be helpful if your kitty has plenty of quiet places to get away if he needs to. Playing with him and keeping his schedule as routine as possible will also help reduce stress. Since stress is a very large contributor to immune system suppression, keeping his world as low-stress as possible is a great start! Thank you Camille for answering back. Yes my cat has a quiet life and a routine which i like to keep. He was ok for 3 years and now he starts to have problem. Is it possible that its because i have a new grandson and come home with a different smell on my cloths ?? I asked the Vet and he said there is nothing he can give me for the Immune system, cat need to stay stress free ( what a ” great ” answer ). I truly believe stress has a huge impact on the immune system…I hope your kitty does well! Thank you for reading! Hi Tina, since there are so many factors that can cause vomiting in cats and kittens, I would recommend calling your vet’s office. They can ask you additional questions for clarification and may be able to give you advice right over the phone. Any time kittens have issues, whether it’s throwing up, not eating, diarrhea, etc. it’s always best to check with your vet to be safe since kittens are fragile babies and can get sick very quickly! I have four female cats (sisters) they are all very healthy. I haven’t been able to have them spayed yet. But, all of a sudden, a few have been vomitting. There have been no changes in diet or any other changes. However, there has been a lot of stress. Could the stress be the cause of the vomitting? Hi Penny! Yes, stress can absolutely cause vomiting in cats. Cats are very sensitive to stress in their environment, and stress been linked to numerous health issues, including GI upset and urinary tract inflammation like cystitis. Hopefully once the stress decreases, your kitties’ digestive issues will clear up, but if not, be sure to contact your vet for guidance in ruling out other potential causes. Good luck! My cat Theo pukes basically everyday. Mostly food and not hairballs, for the past four months. I went to the vet after the first two weeks and have continued. He ran blood work, three view xray, and had tried us on two different types of speciality food. We also bought a new bowl so he would slow down while eating. I have told the vet about Theo’s cat tree which he chews on and sometimes eats the carpet fiber and nylon fibers but the vet thinks that isnt a problem. Could anyone help me this. Theo seems normal in all things expect for his puking. Hi Jake, sorry to hear about Theo! Since it’s definitely not normal for cats to vomit daily, you’re right to be concerned. If the vet ran blood work and took x-rays, that would have ruled out some of the more common causes of chronic vomiting, such as hyperthyroidism, liver or kidney problems, or a GI tract obstruction. If you’ve already tried changing Theo’s diet to something more digestible and that still hasn’t helped, I would suggest getting a second opinion from a veterinarian who specializes in Internal Medicine. These vets basically treat everything on the inside of the body, including the gastrointestinal tract and all organ systems. They see many cases of chronic vomiting in dogs and cats, and could have additional insight into what might be the underlying cause of Theo’s vomiting. Since chronic vomiting causes dehydration and electrolyte imbalances in the body, it’s important to figure out what’s causing the issue. If your veterinarian doesn’t have a suggested referral, you can check this website for Internal Medicine vets in your area: http://www.acvim.org/ Just go the “Find a veterinary specialist near you” section and select Internal Medicine from the drop-down menu. 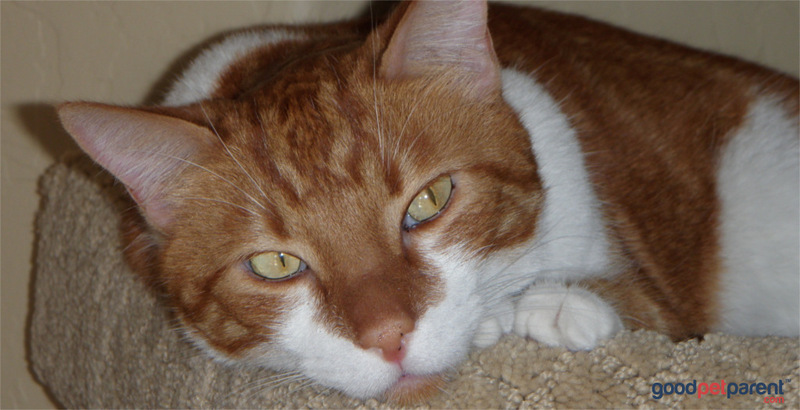 An Internal Medicine vet saved my cat Jasper’s life, so I’m a big believer in seeing a specialist when it’s warranted! Hopefully they can help you diagnose the issue quickly and get Theo what he needs to be happy and healthy again. Good luck, and please keep me posted on what you find out! My kitten is 8months old on Saturday…Today she has been sick and had diarrhea this morning, just about a couple of minutes ago she ran into the living room crying at me sticking her tongue out moving it up and down and then vomited, she doesn’t look ill,she is eating fine and hasn’t lost no weight. I haven’t a clue what to do, any suggestions on what’s wrong? Holly, I’m so sorry, for some reason your comment got caught up in my spam filter! 🙁 Since it’s been several days now, is your kitten doing any better? Sometimes kittens and young cats will vomit if they get overexcited or are running around, especially right after they eat. But the fact that your kitty had diarrhea also pretty much rules that out. Did you recently change her food? Since she’s not acting sick and still has a healthy appetite, my first guess would be that her food might be causing gastrointestinal issues. Cats can sometimes tolerate a food for awhile, but end up developing a sensitivity to it. That being said, if your cat is still vomiting and has diarrhea, I would suggest having her checked out by a vet. Since cats can often hide being sick very well and for a long period of time, I never take a chance with kitties. They can hide illness until they are so sick that they’re in real trouble. And the fact that she is young makes her even more vulnerable. You didn’t mention if she goes outside… if so, she may have picked up a virus or a parasite. Having her checked out by a vet can rule those out, and your vet can also make sure she’s not dehydrated. Please let me know how she’s doing! Our cat got a bad shrimp and started puking up his dry food and white form the next 2 going on 3 days. Any help would be great. Hi Richard! Although cats have acidic stomachs that are designed to kill bacteria, occasionally they can still develop food poisoning from eating something tainted. That being said, food poisoning can be very hard to diagnose in cats since vomiting is a common symptom of other illnesses, so it’s hard to know for sure if the food is what really caused the problem. Other things like hairballs, kidney disease, liver problems, or parasites can also cause sudden-onset vomiting. If your cat is acting normally, not lethargic or hiding, and doesn’t have diarrhea or any other symptoms, you can try giving him something other than dry food for the next few days. Unfortunately, kibble is very difficult to digest, so human baby food can be a good option (Gerber chicken and gravy flavor works great – make sure the brand you buy is just the pureed meat and doesn’t contain rice, vegetables, or onions since onions are toxic to cats), as is a canned cat food that’s not too rich. Offering this in small amounts several times a day could give his stomach a chance to settle down and return to normal. That being said, how you handle a vomiting cat is always done on a case-by-case basis. If you try the baby food or canned food for 2 days or so and he’s still not improving, or if he develops any other symptoms, I would recommend a trip to the vet to make sure there isn’t something else going on. Since cats can become dehydrated very quickly, you don’t want to let vomiting go unchecked. And since vomiting can indicate so many other issues, sometimes it’s better to be safe and have the cat checked out. Please let me know how it goes, and good luck! So we adopted 2 9 week old kittens this afternoon both boys.One has been to the litter box 3 times since being home and has thrown up all 3 times. Once in the box and twice outside the box. First time it was a brown color. The other two were foamy white. I know some time has passed since you brought your kittens home, how are they doing now? Hopefully both are well. You didn’t happen to mention where you adopted your kittens from, but if they came from a shelter, they may have been exposed to several different types of viral infections that can cause vomiting. Also, sometimes kittens will get carsick and that can cause nausea, as can stress. Hopefully you were able to call your vet and get some good advice. Kittens can become dehydrated very quickly, so when they are that young it’s important to check with your veterinarian if they have multiple episodes of vomiting. If you’re able, please let me know how your little ones are doing! I have two cats. One is 10+ years old, the other is almost 2 years old. They are both females. The older one constantly bullys the younger one. The younger one is always throwing up little balls of barely digested dry cat food. It seems like every 1-3 days at least I am finding these clumps. She appears to have no other issues and is very healthy in appearance. I have been paying attention to her use of the litter box and it appears normal. The only thing I can think of is that she’s eating too fast because she wants to get the food and get out, because of the other cat. She is always on the lookout for the older cat and won’t even touch food without first checking to see if the older cat isn’t around or paying attention. Does this sound correct? Should I be concerned? Oddly, when I feed them wet food (I would say wet food is about 1/4 of their diet, there is never any puked balls of food. Hi Dan! I think you are probably spot-on. It’s very common for cats who eat too quickly (or under duress) to vomit their food right after. Also, dry food is much harder to digest than wet food (cats usually swallow dry food whole, so it takes a long time to break down in the stomach), so that could explain why your younger cat does better on the wet food. I would suggest trying to make the majority of both your cats’ food the wet variety. Wet food has a higher moisture content, which helps keep cats hydrated (better in the long run for their kidneys), and it’s less likely to cause digestive upset. Additionally, I would try feeding your cats in separate rooms and see if that helps. For your younger girl, take a look at her feeding station location through her eyes…is it in a high-traffic area, or in a quiet corner? The best location for nervous cats is in a separate room or area away from noise, traffic, and other cats in the household. That could help alleviate some of her nervousness. I have an 11 year old Devon Rex who has been in excellent health until about 3 months ago when she began vomitting ar 4am just before using the litter box. She will vomit bile and then urinate and then deficate. She is not vocal while eliminating. We’ve run tests and everything is normal. The vet thinks she has IBD. I’ve tried diet changes.. Nothing has helped. Any thoughts? Hi Suzanne! The fact that the vomiting started fairly abruptly at age 11 could indeed be indicative of IBD. For the diet changes you mentioned, were they single-protein source, limited ingredient foods recommended by your vet? And did you try each one exclusively for at least 8-12 weeks? Some cats have food allergies or sensitivities to certain proteins, artificial flavors or colors, or certain types of grains that can trigger IBD, but for others, there doesn’t seem to be any correlation to the type of food that is fed. Those are the most frustrating cases. Unfortunately, the only way to definitively diagnose IBD is with an intestinal biopsy, which requires general anesthesia. If you decide to have that done (if you haven’t already) and it comes back positive for IBD, it can be treated with steroids to suppress the inflammation in your cat’s GI tract. Although steroids have side effects, in IBD cases they can be very effective in giving a chronically-vomiting cat a better quality of life. One last thought…if you do the biopsy to test for IBD and it comes back negative, I would suggest getting another point of view from an Internal Medicine Vet. These veterinarians are experts in treating mystery cases, and I’ve had great success with them with my own cats. Please let me know how things go! Thanks so much. Since that post, my other Devon, 14yrs old, already diagnosed with IBD was diagnosed with liver disease and is currently fighting for her life. I am force feeding her but am struggling to get enough in her and a feeding tube was recommended. She is on subQ fluids everyday and I can’t afford the feeding tube and her current care is extremely costly. I’m not sure how much more I can provide of it. Do you have any encouragement to offer for cats like this? She’s 8lbs…the vet has said he’s not ready to recommend euthanasia and she has a chance to recover, but I know each day is vital. I’m sending good wishes your way and praying for a positive outcome!! We are now trying to raise money for that test. The feeding tube cost plus tests were almost $2500. Well worth saying this sweet girl’s life! i have a four month old male kitten, His name is Oscar J. A friend came and dropped a different kind of hard food off,. and My poor little guys been vomiting white foam and now yellow bile , . he has done this appr. 6 times now in 5hrs, I am taking him to vet , He will sleep for a tiny bit then wake up with the cry, and heaves bile, WHat can i do for him until do for him until i can get him to vet? Hi Annie, I’m so sorry I wasn’t able to respond before now, I was on hiatus from the blog dealing with a family emergency. 🙁 How is your kitten now? Kittens that young can vomit because of many different things, including parasites and diseases, so I’m hoping the vet was able to get him the help he needed. They can often dehydrate quickly, so getting them to the vet as fast as possible is usually the best course of action. Oh that’s wonderful news!! I’m so happy to hear Oscar is doing so well! 🙂 You are so right, with kittens and puppies it’s always best to get them to a vet ASAP. In Oscar’s case, this was a worst-case scenario and unfortunately many kittens don’t survive that type of situation. I’m so glad to hear that he did! And you make an excellent point.. although looking things up online can be very helpful in some cases, trying to diagnose a sick pet online is usually wasting precious time. Best to get them true medical attention as soon as you can. My cat is 11 he started having stomach problems and hair balls 3 year’s ago,after we took him with us on vacation, he’s a very stressed cat. I’ve took him to the vet,and they think he has sensitive stomach to hairballs. He doesn’t throw up everyday if he does sometimes as you see a hair bow or white foamy stuff if he doesn’t get to eat soon enough or he eats too fast periods. One day I noticed that he was looking really rough and drinking a lot of water and urinating a lot I took him to the vet and he was diagnosed with diabetus and March of 2017 this year. I noticed that when he didn’t groom he never threw up for over a month because they don’t groom when they have diabetes in their sick. So no grooming no hairballs no throw up. But now thank the Lord he’s off of insulin he was only on it 3 months before he went into remission and doing great and his numbers. The vet said she didn’t think he had diabetes she thinks something three men to diabetes. But anyway he went back to his hairball grooming and now he’s starting to throw up again hairballs and then he gets sensitive stomach and sometimes throws up in the morning before he eats. So I took him back to the vet again lots of money to put him on a allergy dietRabbit and Pea. . Which does it seem to be doing any good at all it’s fine royal Canin diet for allergies. I’m seeing no difference whatsoever he seems to burp a lot and his stomach makes noises on this food. He’s hungry all the time he never seems to gain over 11 pounds and he’s a big cat American Bobtail. I’m at my Wit’s End to what to do they said they can do biopsies and alter sounds that’s a lot of money and I’ve already spent thousands. Trying different foods invest. He seems normal plays looks good,go to potty runs acts happy and then ..hairballs or sallowing like something in his throat, sometimes he throws up just hair no ball just lose hair.I’m at my wits in after the dibeatis and back to the puking. What do you think of the Royal Canin? PR ?,it’s so pricey and it’s not helping.I was told it was rabbit meal,and peas. .I can smell the peas.looks like mush.I’m going to try FF beef pate.low carb high protein. But I will have to give him ceria for nausea, or he’ll throw up till he’s changed over.I keep it in hand with a jel the vet gave me you put on his ear.the jel is for reflux GI track apatite stimulant.once he gets his stomach clam he’s fine.any advice would help ..and a good food. My 12 year old cat has been throwing up undigested food, and hairballs. She’s gotten worse as she’s gotten older, I’ve taken her to the vet and everything came back fine, they recommended I switch her to royal canin hairball remedy, but she’s still having issues. I feed her wet food daily, I’ve tried the royal canin wet food, but she won’t eat it, so I give her the fancy feast canned food bc she will eat that. She eats dry food, and throws up in the basement where the litter boxes are. I don’t what else I can do to help prevent her from throwing up, and if it’s caused by the hairballs, or if she’s eating too fast. She’s usually throwing up when I’m not there, so I’m not sure if the other cat is being a bully to her or what’s going on. Any advice to help stop the puking? One of my cats throws up wet food if she gets too much of it, so I just give her the gravy out of it, and let the other cats have the solid part. I have a five-year old cat, Simon, who up until recently has always been very healthy, though he does vomit occasionally, maybe once every couple months. About two weeks ago, he started vomiting on a very regular basis. two or three times per day, and vomiting a lot of food. He is also not having bowel movements, because nothing is getting that far. I took him to the vet last week and the vet did blood tests and x-rays which all revealed nothing, his organs are working fine and there doesn’t appear to be any obstructions. The vet recommended changing his food and giving him Metoclopramide, which within a half hour after receiving this, he throws it up. He won’t go near the new cat food, and went hungry for three days so I caved and gave him some of his old food to at least get something in him. He seemed fine for a day, no vomiting, but now today he’s vomiting again and isn’t eating anything. While he isn’t as active as usual, he’s also not just laying around acting sick either. I just don’t know what to do for him. Is there any other answers we could possibly be missing? Hi Julie! Sudden onset vomiting in cats can be scary, as cats tend to exist in a mild state of dehydration normally, so when they don’t eat or drink they can become dehydrated very quickly. You did the right thing in giving Simon his old food when he stopped eating, since cats who suddenly stop eating for more than a few days can develop a metabolic disease called hepatic lipidosis, or fatty liver disease. Does Simon go outside? Many parasites can cause this type of vomiting. So can pancreatitis, which is often misdiagnosed in cats (you can read more about it here: https://www.goodpetparent.com/2015/10/23/pancreatitis/ ). Pancreatitis is definitively diagnosed by running an LPI, or pancreatic lipase immunoreactivity, blood test. Have there been any changes in Simon’s environment over the last few weeks? Stress and anxiety can also cause cats to vomit. Unfortunately, there are certain types of cancer, such as intestinal lymphoma, that can cause this too, but hopefully that is not the case with Simon (although it can be found in young cats, it’s much more common in older kitties). I know it’s been a few days since you wrote, how is Simon doing now? I always recommend that cats who aren’t eating get some type of veterinary intervention (such as subcutaneous fluids given with a needle under the skin, or injectable medications if they can’t keep oral ones down), as they can decline pretty quickly. If he’s still not eating well, I would also recommend trying Simon on chicken baby food for a few days. I use it with my cats with great results, as it seems to calm down their GI tracts and is very easy to digest. (You’ll want to look for the Gerber brand “Chicken and Chicken Gravy”, as it has no onion added, which is toxic to cats.) But as always, work closely with your veterinarian and keep him or her in the loop with everything that’s happening – cats who aren’t eating were always considered a high priority in the clinic where I worked, so don’t hesitate to call your vet daily if Simon is not improving! Good luck, and please let me know how he’s doing! Hi, Simon is doing quite a bit better. He still vomits about once a week, but is keeping his food down and using the litter box regularly the rest of the time. We’ve been giving both of our cats a mixture of their old food and new food, but it’s pretty clear they don’t like the new food very much. We’ll just keep monitoring him for a while. Our vet mentioned that if frequent vomiting continued to test him for Pancreatitis, but he seems to be back to his usual self. Oh, and he is strictly an indoor cat. That’s good to hear! I’m so glad Simon is feeling better!! About a month ago we adopted our cat Bones from some lady’s private rescue that she operates through our local Petco. He was 5 months old at the time and just turned 6 months old. We noticed immediately that he was having diarrhea, so we took him to the vet and they told us he had Giardia. They started him on a liquid medicine at first, but it was hard to get him to take it so they gave us a new medicine to put in his food. After about a week after the second medicine, we noticed he was still having diarhhea so we called the vet back and ended up bringing another stool sample for them to check. They called us back last week and told us there was no sign of Giardia anymore, but he is still having problems. Today he threw up for the first time that we’ve seen, but he seems to be acting fine. Any advice on what could be causing his GI distress?? Thanks! COUGHING UP MY CAT WAKES UP, THEN THROWS UP. USUALLY THIS HAPPENS AT ABOUT THE SAME TIME OR HOUR EVERYDAY. Hi JD, if your cat is vomiting every day he should definitely be seen by a veterinarian. Is he vomiting food, hair, or liquid/foam? It could also be that he’s actually having an asthma attack, as that can sound like vomiting, and some cats may spit up a little foam afterwards. Either way, I would get him checked out by a vet. Good luck! My cat was throwing up a small amount of bile every morning for several weeks. It looked like a thick yellow saliva. I was eating vanilla ice cream just before bed time and allowing my cat to lick the small amount of melted ice cream in the bottom of the bowl. I read vet articles on the internet that said cats should not be given dairy products because they cannot digest them – and this can cause a cat to throw up. Though I knew this I thought that just licking the ice cream bowl was not a large amount and this would be OK. Well, that isn’t true in this case. When I stopped allowing the cat to lick the ice cream bowl, the throwing up stopped. My cat was disappointed but the issue didn’t return. Our 8 year old lively kitty is our puppy’s favorite. I am afraid that the pup chased our cat Panda into something, or perhaps body slammed him, as the kitty has been Vomiting for a couple of days. No blood as far as I can see. He has gone from plump to slender though. His eyes are tearing at times, and his usual upper respiratory wheezing sounds a little worse. (we found him as a kitten in the snow). Will the vet insist on all the tests and cost us a fortune? How urgent is this? Or could it be a chicken bone he found somewhere? Sometimes he gets out at night for an hour or so, he’s hard to run after. Thank you!